Formal Methods are one means in Software Engineering that can help ensure that a computer system meets its requirements. They can help make descriptions precise. Such descriptions include requirements, specifications, and models, which appear at different levels and moments in the software development life cycle. They can also help in different kinds of analysis. The use of Formal Methods in Verification and Validation is wide and includes techniques such as static analysis, formal testing, model checking, runtime verification, and theorem proving. In many engineering-based application areas of computer science, e.g., in the railway domain, Formal Methods have meanwhile reached a level of maturity that already enables the compilation of a so-called body of knowledge, i.e., a handbook compiling the key concepts, terms and activities that constitute the professional domain [GHMR13]. In 2011, Barnes stated that “the application of Formal Methods is a cost effective route to the development of high integrity software” [Bar11]. In the hardware domain, Formal Methods are an essential part of the design processes [Lam05]. In Computer Science education, however, Formal Methods often play a minor role only. Typical questions raised in curriculum discussions include: Which of the many Formal Methods shall be taught? Will the material taught be accessible to mainstream students? Will a Formal Methods course be attractive to students? Are there teachable case studies beyond the toy example level? Can students be involved in real projects where they can apply Formal Methods? doctoral students in their early years, possibly in search of a suitable topic for their dissertation. The rest of this paper is divided as follows. Section 2 presents the ten principles we propose for teaching Formal Methods with a view to making the subject fun and favourable. These serve as the guiding beacons for the writing of the book. Section 3 describes some of the student feedback we have received on delivering the contents of the book at a recent summer school. This provides a critical source of evaluation for us. Section 4 reviews some of the relevant literature in this area. Section 5 concludes the paper. The inception of our book is due to the 1st International School on Software Engineering and Formal Methods held in Cape Town, South Africa, in late October to early November of 2008. The two-week school consisted of five courses on the application of Formal Methods to software design and verification delivered to an audience of graduate and research students. The focus of the book on addressing the fundamentals and facilitating learning through examples is largely owed to the instructional setting offered by the school. We have approached the subject of the book with a similar readership in mind and a strong desire to make the subject more widely accessible. In the following, we state and exemplify our principles for teaching Fun With Formal Methods. The variety of Formal Methods is overwhelming. This might leave the beginner or potential user to be lost in the field. Which method shall be selected in a given context? Here we recommend teaching a non-representative selection of methods with a solid introduction to each of them. Specialisation in one method is unproblematic, as the foundations of Formal Methods are well connected. For instance, concepts studied, say, in the context of process algebra, are also to be found in temporal logics, which again are closely connected to automata theory, and are applied, e.g., in testing. Within a discipline, there are often attempts to unify structural insights. In logics, for example, the theory of institutions provides a general framework in which logical properties can be studied in a uniform way. The methodological approach to different Formal Methods often is comparable. Consequently, there is loads to gain by intensively studying selected few methods. Although at the beginning computer science was strongly influenced by Mathematics, within the last 50 years it has become more and more of an engineering discipline. A fact is that many CS students quit because they cannot see the relevance of their first years’ Mathematics classes to the engineering problems they want to solve. Thus, we encourage to motivate the introduction of Formal Methods by engineering challenges. For example, we see Formal Methods as part of a Software Engineering curriculum. Here, it should be conveyed that the use of Formal Methods in a software development is not constrained to a specific process and life cycle model. That is, Formal Methods can be used with traditional as well as agile models. Moreover, Formal Methods should not constitute separate phases or sprints, but should be rather integrated as part of the general validation activities. Thus, teaching Formal Methods should frequently resort to other topics in Software Engineering. Mishra and Schlingloff [MS08] evaluate the compliance of Formal Methods with process areas identified in CMMI-DEV, the capability maturity model integration for development. Their result is that out of 22 process areas from CMMI, six can be satisfied fully or largely with a formal specification based development approach. Notably, the process areas of requirements management, product integration, requirements development, technical solutions, and validation and verification are supported to a large extent. Mishra and Schlingloff also show the possibility of automation in process compliance, which reduces the effort for the implementation of a process model. Formal Methods begin to play a significant role also in Software Engineering standards. For example, the RTCA standard DO-178C “Software Considerations in Airborne Systems and Equipment Certification”, includes the DO-333 “Formal Methods” supplement addressing Formal Methods to complement testing. Using this example and the engineering challenges which led to its conception can greatly increase the students’ motivation. Furthermore, success stories related to industrial applications and successful careers in academia and in industry can support this argument. The number of axioms when applying Formal Methods is by magnitudes larger than the number of axioms involved in Mathematical theories. Consequently, tool support is needed in Formal Methods for sheer book keeping. Most software systems are the intellectual property of a company. This restricts access to the actual code; interest in their design is limited. Mathematical theories are part of the scientific process and publicly available. There is scientific interest in them. Therefore, proofs related to a specific software system are studied by few people only, and only when necessary – while Mathematical proofs are studied by many, over and over again. Consequently, tools play the role of “proof checkers” for quality control in Formal Methods. Requirements of software systems are bound to change in small time intervals. This means that design steps involving Formal Methods need to be repeated several times, sometimes already during the design phase, certainly when maintaining the system. Mathematical theories, however, are stable over centuries. Consequently, tools are needed to help with management of change in Formal Methods. Thus, it is essential that students have access to powerful, even industrial-strength tools. They should also be referred to databases with “big” examples on which they can try these tools. There is a plethora of free Formal Methods tools available, and many tool providers will give students free access to expensive commercial tools, if certain legal restrictions are met. Usually, the negotiation process takes several month, so start well in advance. Models of software systems are different from programming code as programs are executable, while models are not in general though they might be executable. A model is a purposeful abstraction of either an existing system or a system still to be built. In the first case, the purpose of modelling is of analytical nature, in the second case the aim is to assist system construction. Other differences concern validation, verification and refinement. Models can be constructed at a high level of abstraction on which data and processes may often be described in an intuitive way. In programming it is necessary to spell out how to implement this data and processes by adding details. In fact, modelling can focus on the central ideas, irrelevant details are abstracted away. Here, the usability, i.e., the ease to express these ideas, is important when choosing a modelling language. Such languages often have a visual representation, e.g., automata, process algebras, Petri nets. Tool can support such visualisations allowing to design models in an intuitive way and to easily learn the semantics. This process relates the informal system description with the most abstract formal level. In this context, the aim of a model is to provide evidence that the modelled system satisfies given properties. In a model-based approach informal properties may be formalised as processes or logic formulae. Although natural language descriptions are easily comprehensible, finding their correct formalisations is a hard task. Consequently, providing templates which correspond to well-known properties may assist students in their specification efforts. This also may help them to understand the correspondence between the natural language formulation and the formalisation of the property. Refinement transforms an abstract model into a more concrete one, whereas verification gives a formal argument for the correspondence between the two. The more concrete a model is, the harder becomes the verification task. In this context it is important to convey two messages: tools are required to perform verification, see Principle 3; abstraction is an important precondition to work with Formal Methods tools. In the old days, a programming language was taught by going through its syntactic constructs and highlighting the (denotational or operational) semantics associated with each construct. Like it or not - this is no longer the way that programming is learned. Similar to children learning to speak, nowadays students learn to program by mimicking and modifying given examples, interacting with an IDE, and experimenting with the results. Fig. 1: Snapshot of Hets validating the database specification. We claim that the same should hold for Formal Methods. Instead of tediously going through the semantics of each construct in a formal language, allow the students to experiment with an appropriate tool to discover the semantics for themselves. Non-withstanding, the formal semantics needs to be available so students can use it in case of need. That is, students can actually experiment with the database and can see if their understanding of how it should behave is met. 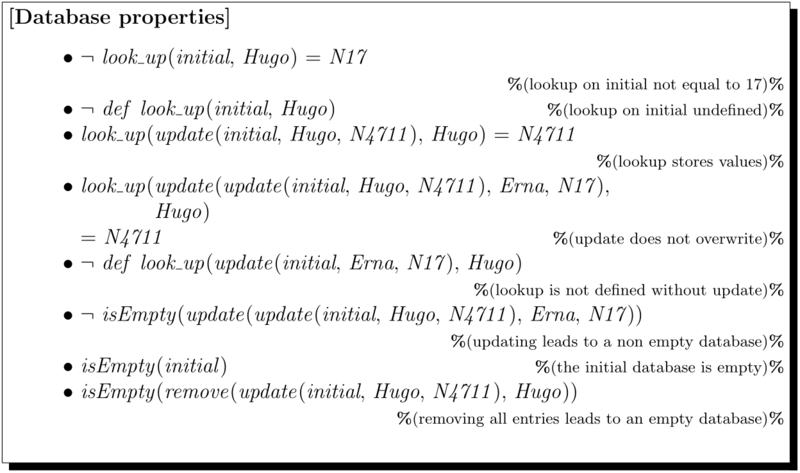 For instance, a database can have an overwriting semantics – two updates for the same name are possible, the last update determines the value (this is the way how the database is specified here); another design choice would be that the update function is only defined for names not yet present in the database. This example shows that it is beneficial to study specifications by the means of tools. For students, carefully designed lab classes can be enormously motivating – see the student quotes in Section 3 concerning Reflections. Labs can offer hands-on experience with Formal Methods tools and practical examples. Such teaching style appeals to the plug-and-play mindset of a student generation who loves to play with gadgets of all kinds. Furthermore, it can provide the students with a sense of achievement: students use Formal Methods with a concrete, visible effect on their screen – rather than being lost or even frustrated in some semantical detail. Beyond such fun and achievement aspects, lab classes allow students to judge how mature the tool support for a specific method is. 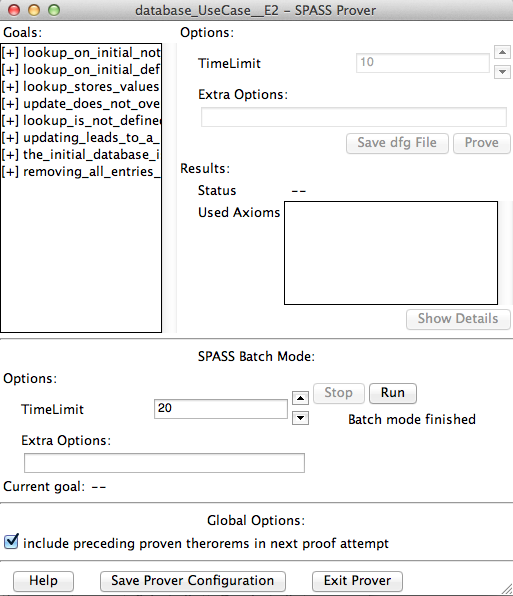 When preparing lab classes, to minimise the effort it is worthwhile – and we do so in the context of our book project – to work with frozen versions of tools compiled on a live-CD. Freezing the tools ensures that the effects one wishes to demonstrate are actually there (e.g., a time-out in an automatic theorem prover or a model checker, where a small change of the tool’s search heuristics can change the outcome). Moreover, the use of a live-CD circumvents installation problems. Entering the command "probe" starts the simulator ProBe from a terminal. The simulator opens in a GUI. One loads the file "childrensPuzzle.csp" by choosing the File option. This launches a new window. Double clicking on the process "Children" allows one to expand the process as shown in the lectures. Following any execution branch eventually yields a state where all three children hold 4 candies. Here, the Children-and-Candy puzzle is an example already known from the lectures, where in the lab class the students shall explore and experience that: (1) the system has many different execution paths, and (2) these paths are infinite. The next step can then concern a change within the example (for example change the number of children, i.e., processes, involved in the puzzle). Only then students should be asked to develop own examples. Such an approach separates learning the (basic) functions of the tool, dealing with mistakes and error messages (when changing the example), and mastering the method (when working out an own example from scratch). Either the prize is in the middle basket, or the right basket is empty. If the prize is not in the left basket, then it is not in the middle. Which basket do you choose? This example is typical for a number of "logic puzzles" which have been popular since the middle of the 19th century. One can formalise and solve such puzzles - not just for the sake of winning in TV quiz shows, but also to construct software solutions for all sorts of problems. Seen from a hardware perspective, nowadays every computer is a binary device, built from switching elements which can be in one of two states each - on or off, high or low, zero or one, etc. Therefore, hardware can be described and analysed with logical means. From a software perspective, every programming language incorporates some logic, e.g., propositional logic for Boolean conditions in control flow decisions such as branches or loops. Thus, the study of logic is fundamental for programming. There even are special programming languages like, e.g., PROLOG, in which logic is turned into a programming paradigm. For many programming languages, there are special logics to express certain properties of program phrases, e.g., pre- and post-conditions. Examples include ACSL for C, JML for Java, and Spark Ada. Moreover, logic can be used as a means for specification of systems, independent of the particular programming language. Examples are CASL and the Z and B specification languages. Given a system specification, logic can be used to verify that a particular program is correct with respect to it. Specialised logics have been developed for this task, including temporal and dynamic logics. The syntax of a logic usually is given by a small grammar which defines the well-formed formulae. For the semantics, notions like "model", "interpretation" and "validity" are defined. The method usually includes ways to show which formulae are valid in a given model or in all models of a certain class. All the above examples are familiar to computer science students. [Motivation] Assume that we want to replace all occurrences of certain patterns in a text, e.g. remove all comments from an HTML document. In HTML, comments are marked beginning with "<!--" and ending with "-->". Most editors offer a facility for replacement based on regular expressions, that is, you may specify the symbol '*' as a wildcard in the search. With this, replacing “<!--*-->” by an empty string yields the desired result. Semantically, regular expressions can be dealt with in denotational, operational, and axiomatic style. [[a]] ≜ for any a ∈ . That is, the regular expression ‘ a ’ defines the language consisting solely of the one-letter word ‘ a ’. [[λ]] ≜ . That is, λ denotes the empty language. [Operational semantics] For any regular expression φ, we define an automaton A(φ), that is, a graph (N,E,s0,SF), where N is a nonempty set of nodes, E ⊆ (N × A ×N) ∪ (N × N) is a set of (labelled) edges, s0∈ N is the initial node and SF⊆ N is the set of final nodes. A(a) ≜ (,,s0,) for any letter a ∈ . A formal language is described by an unambiguous syntax and a Mathematical semantics. For a Formal Method (as opposed to a formal language) it is essential that there are some algorithms or procedures which describe what can be done with the syntactic objects in practice. A Formal Method describes how to “work with the language”, that is, perform some activity on its elements in order to achieve certain results. The Backus-Naur-Form being introduced this way, we take care to present other formal languages in exactly the same format, e.g., various logics and process algebra. In order to give students an orientation, it is important to provide a taxonomy. Formal Methods can, e.g., be categorised according to the following dimensions. Underlying technology – this dimension notes how the method can be realised. Typical methods include refinement, simulation and symbolic execution, model-checking, automated or interactive theorem proving, static analysis, etc., with technologies such as resolution, SAT solving, symbolic representation, etc. Other criteria can include lightweight vs. heavyweight Formal Methods, specification focussed vs. analysis focussed, correctness-by-construction vs. design-and-proof-methodology, etc. Principle 10: Formal Methods are fun – shout it out loud! Psychology tells us that the human learning capacity is highest when we enjoy what we are doing. Many researchers are attracted to Formal Methods just because it is fun to play with them – so the best way of teaching is to convey this fun to the students. [Fun with Formal Methods] What is a Formal Method? You have just bought a book on Formal Methods and are making holiday plans in the Caribbean to read it on the beach. In order to guarantee the reservation, your travel agent requires a deposit. You decide to pay electronically via credit card. With such a motivation, we describe some typical requirements for an electronic payment system. Competitions are also strong motivators. There exist several competitions in the Formal Methods community, e.g., the VerifyThis Verification Competition, the Hardware Model Checking Competition, or the SAT competition. Of course, it is not easy for a beginner to enter such a competition, but you can set up an accessible competition amongst your class and provide a small price. There was unanimous support (60% agreement, 40% strong agreement) for the statement “Teaching and learning methods used have enabled me to learn effectively”. 80% of the participants agreed or agreed strongly to the statement “Teaching resources were adequate”, reflecting the fact that some participants would have liked more practical examples and lab classes. Summarising, we can conclude that our approach to teaching Formal Methods for Software Engineering is quite successful, and that the ten principles mentioned above have passed the on-road test of classroom use. The Formal Methods community has been well aware of the didactic challenges faced in teaching of the subject. We find a variety of approaches adopted in the teaching delivery of the subject. Gibson and Mèry [GM98] reveal some lessons from their case study-led approach to a course where fundamental problems, and the need for formality, is demonstrated over a set of case studies delivered to students. They also emphasise the need for tool support and the practical hands-on nature of the learning that such provision facilitates. This is evidenced to provide for rich interaction between the teacher and the learner, ultimately helping both. Our principles embrace both of these lessons. The use of tool support and practical learning has also been advocated by Heitmeyer [Hei98] and Liu et al. [LTHN09]. The latter, however, promote the value of writing formal specifications by hand to start with. This allows them to learn syntax and semantics as if it were a foreign language for adoption. The use of examples and case studies for their instructive value is acknowledged by several authors [Bur95, GM98, Hei98, RS04]. Moreover, their effective value for student assessment is recognised by Sotiriadou and Kefalas [SK00] while pointing out to the need for equal emphasis on both understanding and ability to construct formal specifications. A dearth of real world case studies is a challenge we face if such an approach for teaching and learning is to be pursued arguably [Bur95, Hei98]. Over the years, the situation has improved as the uptake of Formal Methods in the industry progresses [WLBF09]. However, student motivation remains a concern and, as Reed and Sinclair [RS04] show, using smaller persistent examples is but only one way to address this problem, albeit to limited effect. There is consensus amongst the community on the two-way relationship that exists between the state of adoption of Formal Methods within the industry and the quality of teaching of the subject [Hei98, Bur95, RS04, Bj¯01]. While the former serves as a potential lack of motivation, the situation is not helped by rolling sets of graduates who come with limited knowledge or experience of the subject. Undoubtedly, any solution needs to address fundamental problems of student attitudes (to subjects such as Mathematics [Fin03] and the true cost of software errors in the industry [JMÿ06]). Recent reforms to the teaching of computer sciences in the UK schools, where appropriate emphasis on programming and problem-solving nature of the subject is placed [BKC+13], lay down the foundation to a student body more able and equipped for Formal Methods in the future. A report of the Joint Task Force on computing curricula established by the IEEE Computer Society and the ACM [oCC04] on Software Engineering Education Knowledge (SEEK) addresses the design and content of software engineering programmes with reference to the work on Software Engineering Body of Knowledge (SWEBOK work). The report suggests that SEEK should define how to educate a software engineer to achieve, in the required time, the knowledge and experience of a practising software engineer as described in SWEBOK; CS curricula should have significant real-world basis necessary to enable effective learning of software engineering skills and concepts and should incorporate Capstone projects. With reference to the first suggestion, Bowen and Reves [BR11] propose that work on Formal Methods Education Knowledge (FMEK) and Formal Methods Body of Knowledge (FMBOK) starts hand-in-hand, following the pattern that the wider software engineering community has successfully developed. They also emphasise on how to develop a Community of Practice in Formal Methods and on the role of such a Community of Practise in the work on FMEK and FMBOK. Cerone and Sowe [CS10] address the second suggestion by proposing a learning framework in which students participate in Open Source Software (OSS) projects, reverse engineer OSS code into a formal model and apply formal techniques to analyse the model. While the above issues inform the endeavours towards writing our book, including lessons from those who have strived to achieve the same [Bj¯01], our approach promises a departure from tradition to a more fresh approach. The challenge of Software Engineering has been acknowledged for decades now; the notion of software crisis has been related to the debate on software industry [Dij72, NR69] since early days. It is safe to presume the state of the industry will continue this course unless methods and practices are addressed. Our book is motivated by the very challenge and has set out to address the fundamental need for clear and coherent reasoning. We also acknowledge that a new era has dawned with breakthroughs in electronics and communications, and as such three trends have emerged over the recent years: (a) software is increasingly designed to support critical systems, which require safety and reliability guarantees to be predicated over execution, (b) modern computing is becoming pervasive [Sat01]. No longer is software sitting comfortably on desktops, but seamlessly dispersed across urban and household installations, needing to be open to cross-layer configuration and communication, and (c) user centricity is vital. As systems become more interactive, how they appear to and engage end-users has received more attention than ever before [Dix10]. We make a deliberate effort to encourage the influence of the above themes over several examples of applications spreading across the book. Such trends only add to the challenge of Software Engineering as they bring increased complexity in requirements and specification, added layers of abstraction for design, and the potential for subtle errors at the implementation stage. Equally, however, they make the examples motivating and fun. The book is due out. Watch this space! We would like to express our sincere gratitude to colleagues and students who have contributed to our writing effort over discussions, lectures and the three summer schools. Amongst them, we especially want to thank Erwin R. Catesbeiana (Jr) for motivating classroom experiences. All this has helped with forming ideas and reflections over the content and style of the book. We remain grateful to the wider Formal Methods community who, over the years, has also informed the debate on how best to teach the subject and ensure that this carries on. This work is partly supported by Macao Foundation. [Bac59] J.W. Backus. The syntax and semantics of the proposed international algebraic language of the Zurich ACM-GAMM Conference. In Proceedings of the International Conference on Information Processing. UNESCO, 1959. Available via the web site of the Computer History Museum’s Software Preservation Group, http://www.softwarepreservation.org. [Bar11] Janet Elizabeth Barnes. Experiences in the industrial use of Formal Methods. In Alexander Romanovsky, Cliff Jones, Jens Bendiposto, and Michael Leuschel, editors, AVoCS’11. Electronic Communications of the EASST, 2011. [Bj¯01] Dines Bj¯rner. On teaching software engineering based on formal techniques - thoughts about and plans for - a different software engineering text book. Journal of Universal Computer Science, 7(8):641–667, 2001. [BKC+13] Neil Christopher Charles Brown, Michael Kˆlling, Tom Crick, Simon Peyton Jones, Simon Humphreys, and Sue Sentance. Bringing computer science back into schools: lessons from the UK. In Proceeding of the 44th ACM technical symposium on Computer science education, pages 269–274. ACM, 2013. [BR11] J.P. Bowen and S. Reeves. From a community of practice to a body of knowledge: a case study of the formal methods community. In Springer, editor, Proceedings of 17th International Symposium on Formal Methods, volume 6664 of Lecture Notes in Computer Science, pages 308–322, 2011. [Bur95] Colin J. Burgess. The role of Formal Methods in Software Engineering education and industry. University of Bristol, UK, 1995. [CRS+] Antonio Cerone, Markus Roggenbach, Bernd-Holger Schlingloff, Gerardo Schneider, and Siraj Ahmed Shaikh. 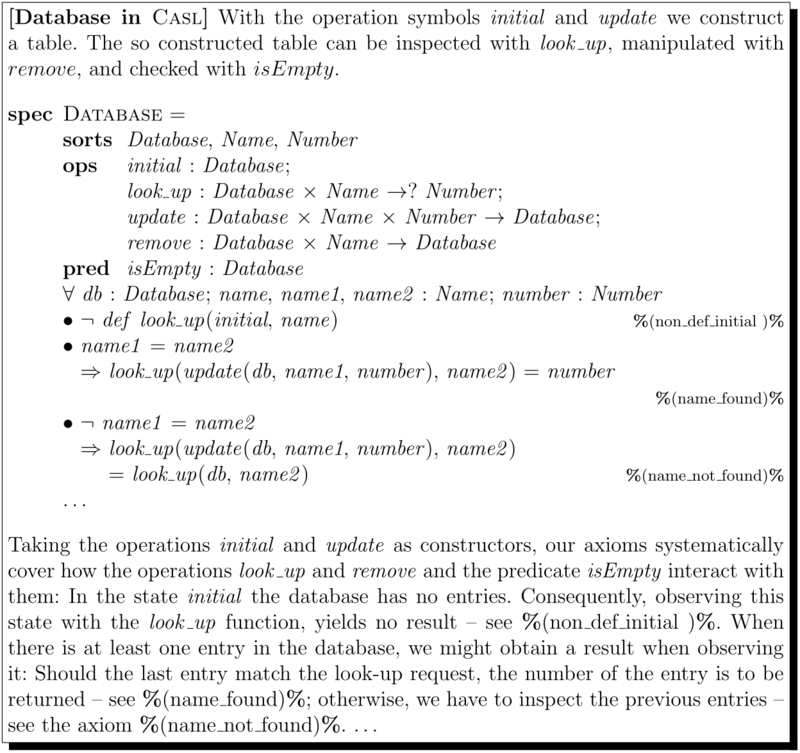 Formal Methods for Software Engineering – Languages, Methods, Application Domains. Springer. To appear. [CS10] Antonio Cerone and Sulayman K. Sowe. Using free/libre open source software projects as e-learning tools. In Proceeding of the Fourth InternationalWorkshop on Foundations and Techniques for Open Source Software Certification (OpenCert 2010), volume 33 of Electronic Communications of the EASST. EASST, 2010. [Dij72] Edsger Dijkstra. The humble programmer. Communications of the ACM, 15(10):859–866, 1972. [Dix10] Alan Dix. Human-computer interaction: A stable discipline, a nascent science, and the growth of the long tail. Interacting with Computers, 22(1):13–27, 2010. [Fin03] Kate Finney. Hello class – let me introduce you to Mr. Six. Teaching Formal Methods, 2003. [GHMR13] Stefan Gruner, Anne E. Haxthausen, Tom Maibaum, and Markus Roggenbach. Towards a Formal Methods Body of Knowledge for Railway conrol and safety systems, 2013. http://ssfmgroup.wordpress.com. [GM98] Jean-Paul Gibson and Dominique Mèry. Teaching Formal Methods: Lessons to learn. In IWFM. Workshops in Computing, BCS, 1998. [Hei98] Constance Heitmeyer. On the need for practical Formal Methods. In Formal Techniques in Real-Time and Fault-Tolerant Systems, pages 18–26. Springer, 1998. [JMÿ06] Magne J¯rgensen and Kjetil Mol¯kken-ÿstvold. How large are software cost overruns? A review of the 1994 CHAOS report. Information and Software Technology, 48(4):297–301, 2006. [Koz94] Dexter Kozen. A completeness theorem for Kleene Algebras and the Algebra of Regular Events. Information and Computation, 110:366–390, 1994. [KS12] Dexter Kozen and Alexandra Silva. Left-handed completeness. In Wolfram Kahl and Timothy G. Griffin, editors, RAMiCS 2012, LNCS 7560, pages 162–178. Springer, 2012. [Lam05] William K. Lam. Hardware Design Verification. Prentice Hall, 2005. [LTHN09] Shaoying Liu, Kazuhiro Takahashi, Toshinori Hayashi, and Toshihiro Nakayama. Teaching Formal Methods in the context of Software Engineering. ACM SIGCSE Bulletin, 41(2):17–23, 2009. [MS08] Satish Mishra and Bernd-Holger Schlingloff. Compliance of CMMI process area with specification based development. In SERA ’08, pages 77–84. IEEE Computer Society, 2008. [NR69] Peter Naur and Brian Randell. Software Engineering Report of a conference sponsored by the NATO Science Committee Garmisch Germany 7th–11th October 1968, 1969. [oCC04] Joint TaskForce on Computing Curricula. Software engineering 2004: Curriculum guidelines for undergraduate degree programs in software engineering. Technical report, IEEE Computer Society and Association for Computing Machinery, 2004. [RS04] Joy N. Reed and Jane E. Sinclair. Motivating study of Formal Methods in the classroom. In Teaching Formal Methods, pages 32–46. Springer, 2004. [Sal66] Arto Salomaa. Two complete axiom systems for the algebra of regular events. J. ACM, 13(1):158–169, January 1966. [Sat01] M. Satyanarayanan. Pervasive computing: vision and challenges. Personal Communications, IEEE, 8(4):10–17, 2001. [SEF] IEEE Conferences on Software Engineering and Formal Methods (SEFM). http://sefm.iist.unu.edu/. [SK00] Anna Sotiriadou and Petros Kefalas. Teaching Formal Methods in computer science undergraduates. Athens, World Scientific Engineering Society Press, pages 91–95, 2000. [WLBF09] Jim Woodcock, Peter Gorm Larsen, Juan Bicarregui, and John S. Fitzgerald. Formal Methods: Practice and experience. ACM Comput. Surv., 41(4), 2009.